The design of the Crooked River will look familiar to hunters and outdoor enthusiasts, but the materials that make it up are new and modern and have been incorporated to extend the life expectancy of this hand-filler. The Crooked River shined when it came down to cutting, skinning, and more demanding tasks associated with life and food prep in the outdoors. This is a great knife when you’re out there in it, but will feel too big for every day carry and use. Like a majority of the Benchmade knives that feature their Axis lock, the Crooked River is built to last and isn’t easily swayed by a few bumps and bruises. The stabilized wood scales and Aluminum Bolsters don’t only pair up nicely, but they’re actually pretty resilient to outdoor life. Additionally, the CPM-S30V blade sits on the higher end of the scale in terms of corrosion resistances, wear resistance, and edge retention. The one puzzling factor is that Benchmade didn’t go with a titanium frame which would make the Crooked River even more of a delight to use. Knives of this size and style aren’t generally this lightweight and don’t deploy nearly as smoothly. 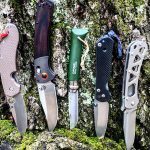 But in terms of function, all of the credit can’t be given to Benchmade as the clip point style blade has been coveted by hunters for years for its amplified ability to pierce as well as move through fur and meat with ease. The Axis lock makes any Benchmade knife a joy to use and acts as an aided insurance policy when performing more demanding tasks, such as batoning. CPM-S30V is one of those steels that the mere mention of will light up a room full of knife nerds. It’s formed from powder which generally eliminates impurities and it’s elemental composition allow it to live in the high end of the corrosion resistances, wear resistance, and edge retention scale. Clip point style blades, like the one featured here on the Crooked River, aren’t as utilitarian as drop point blades and therefore shouldn’t be pried with. But, the overall style, when combined with the false edge on the spine, create a smooth sliding, easy working edge. There are very few Benchmade knives that have ever made me question their worth out in the field. I would go as far as to say that there aren’t any knives in the Hunt line that can’t withstand a bomb blast. With that being said, there’s nothing that really stands out, in terms of durability, with the Crooked River. It does what it’s intended to do and it does it exceedingly well, as expected.